Our accessibility to those sitting in Parliament is astounding and my experience last week was an exceptional example of the openness our MP’s show. Last week I had the privilege of shadowing Marja Lubeck, a list MP for the Labour Party from the Rodney electorate. It was such an incredible experience and opportunity to go behind the scenes and see the day to day workings of Parliament. My day started with a breakfast at Parliament in cooperation with Autism New Zealand for World Autism Awareness, where we heard from Keir and the difficulties he himself faced living with Autism and that his parents faced as well as how LEGO was vital in helping him to communicate. Sitting in this room I felt so insignificant listening to so many change-makers and people who tirelessly worked to raise awareness for Autism. It was incredibly affirming to see the Minister for Social Development and Disability Issues Carmel Sepuloni speak in response to Autism NZ’s concerns surrounding education and health and show what the ministry is doing in regards to development in these areas. It was great to be able to crush any idea I had that MP’s just sit behind their desks all day, but that they actually get out and interact with people who are deeply affected by the decisions that they make. I was able to see the MP who proposed the amendment speak on it, giving her reason why it was important to her. It was a great opportunity for me to learn more about the select committee process. 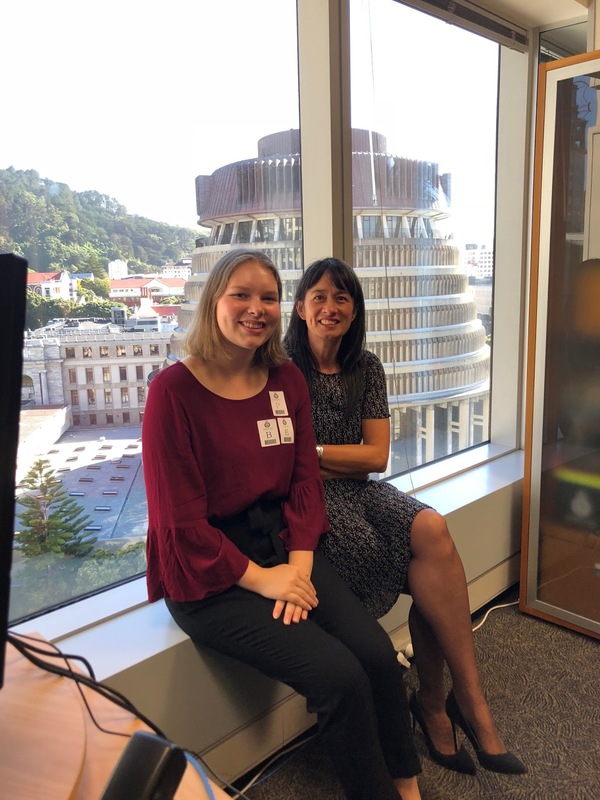 Wednesday was a light day for Marja so we had a bit of downtime in her office and were able to talk about her time in Parliament. It was really valuable to hear from a new MP, how she was finding Parliament and the rules that govern what she is able to do. We discussed civics education and the importance of it as well as the talk on lowering the voting age; it was very surreal to be discussing these ideas with someone who decides the law surrounding these topics. Before question time we walked over to where the media gather in wait for MP’s in order to ask questions about the latest hot topics; it was shocking to watch the media swarm over MP’s and hound them for answers. Marja was kind enough to quickly introduce me to Jacinda Ardern and I think it is such a testament to the friendliness of our MP’s that we are able to meet the Prime Minister with such ease, especially if we look to the United States as a comparison. Question Time as always, was enlightening with the Government and opposition fighting it out; it was particularly interesting with the recent news about Claire Curran and RNZ. It was enjoyable to watch a school group’s faces when there was shouting and name-calling being heard; they were so incredibly shocked because we are led to think that Parliament is such a civilised place- yet when you are fighting for what you believe is right, it isn’t so much. I had the most incredible day with Marja and I thank her and Nick for being incredibly hospitable towards me and ensuring I had an enjoyable day!